When it comes to filling ideas for stuffed chicken breasts, I like to think of ingredient combinations I've seen elsewhere. I've prepared a pasta dish with sun dried tomatoes, spinach and chevre before and so I knew it would be delicious with chicken. There's also a couple ways to stuff chicken. You could use chicken breast halves and pound it thin, place the filling on the edge of one side and then roll up the chicken... or you could use a whole chicken breast, cut a slit to form a pocket in the thickest part of the breast and stuff. Feel free to stuff the chicken as desired. I happened to make a pocket in the chicken to stuff. 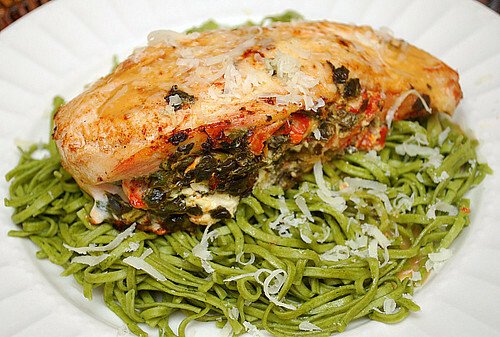 To complete the meal, I served the chicken with spinach linguine. Combine boiling water and tomatoes in a bowl; cover and let stand 30 minutes or until soft. Drain and finely chop. Prepare the chicken breasts by cutting a slit horizontally through the thickest part of the breast to form a pocket, without cutting it completely through. Season the outside of the chicken with salt and pepper; set chicken aside. Heat 1 teaspoon oil in a large nonstick skillet over medium heat. Add onions, sugar, garlic and spinach to the pan and cook 4 minutes. Transfer to a medium bowl. 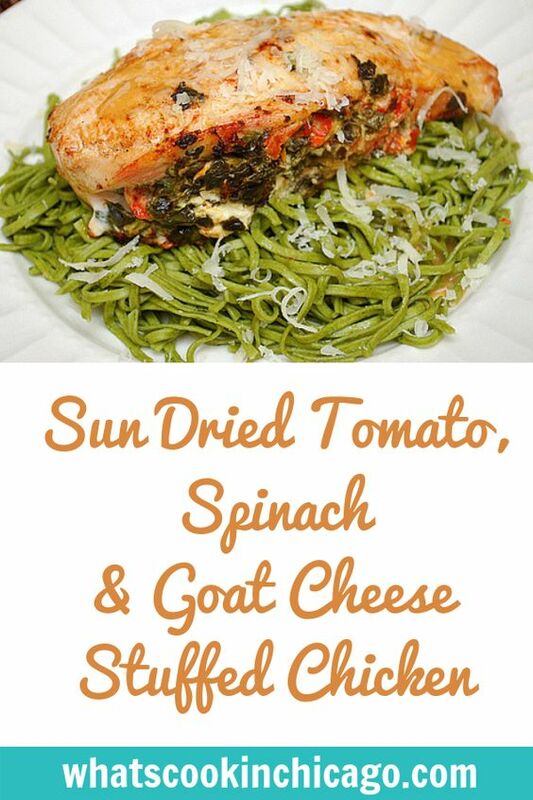 To the bowl, add the chopped sun-dried tomatoes, goat cheese, basil, salt and pepper to taste. Stuff each chicken breast with 1/4 of the filling mixture and place on a parchment lined baking sheet. Bake chicken in the preheated oven for 25-30 degrees, depending on the thickness of your chicken breast. Remove from oven and allow to rest for 5 minutes before serving. * To make ahead/freezer meal - Prepare the recipe as directed above up to the point where the chicken breasts have been stuffed. 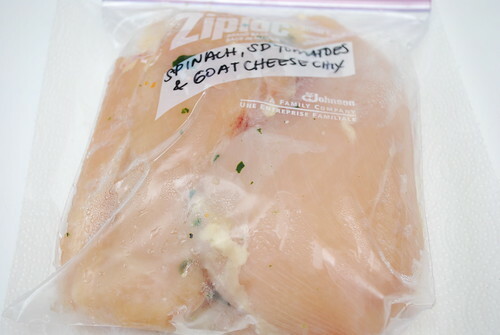 Place the stuffed chicken breasts in a freezer bag and freeze. When ready to prepare, defrost the chicken completely. Preheat oven to 375 degrees and place chicken on a parchment lined baking sheet. Bake chicken in the preheated oven for 25-30 degrees, depending on the thickness of your chicken breast. Remove from oven and allow to rest for 5 minutes before serving.